Smokers don't often talk much about it, but we all worry about the damage we inflict on ourselves by smoking, day in and day out. Another thing we don’t talk about is how much time we spend thinking about quitting...but we do, day in and day out. None of us started smoking thinking we'd lose our right to choose, but that's exactly what nicotine addiction does to us. The associations we build up over time slowly weave their way through every activity in our lives until we can't think of doing anything without our cigarettes. This habit is insidious and tenacious, and millions of lives are lost every year worldwide to it. Thousands of people quit smoking successfully every year. They break the chains of nicotine addiction and they leave smoking behind permanently. You can, too. The quit smoking toolbox gives you links to information and the support you need to build a solid quit smoking program for yourself. Learn what to expect when you stop smoking and have some faith and trust in the process. Remember: Countless others have successfully beat the addiction to nicotine, and you can too. Health Risk and Dangers of Smoking: All smokers harbor the secret hope that they will be spared the disease and death that follows nicotine addiction. We tell ourselves we’ll quit in time and somehow dodge the bullet that smoking is. Why Should You Quit Smoking? Making a list of reasons for quitting is a good first step towards successful smoking cessation. What are your reasons? How to Develop the Will to Quit Smoking: Quitting tobacco is hard for most people. It takes patience, trust, and commitment to the goal. Learn how to condition your mind to build the resolve it takes to quit smoking successfully. Understanding Nicotine Addiction: The effects of nicotine on the human body create dependency through chemical reactions in the brain. Fostering the Mindset for Success: For some people, there is that magical click where everything falls into place before quitting or just after, but for most of us, the reshaping of attitude into the “right” mindset comes gradually, one day at a time. Preparing for Your Quit Date: Preparing yourself for what lies ahead when you quit smoking will add to your ability to make a success of your efforts. Products to Help You Quit Smoking: Learn about the nicotine patch, gum, inhaler, nasal spray, and nicotine lozenges. You'll also find information about alternatives to NRTs, such as bupropion (Zyban or Wellbutrin), varenicline tartrate (Chantix), acupuncture, and hypnosis. Gather Your Supplies: The first several weeks of smoking cessation can be difficult. It's important to have things you can do to distract yourself in mind ahead of time...before the urge to smoke hits. After the Last Cigarette: What happens inside our bodies when we quit using tobacco? Have all of the years of tobacco use caused too much damage for quitting to be of any benefit? Not at all. The human body is amazingly resilient. Within the first 20 minutes of quitting, the physical healing begins. Common Symptoms of Nicotine Withdrawal: Let's review some of the more common symptoms of nicotine withdrawal and what you can do to manage them should they occur. 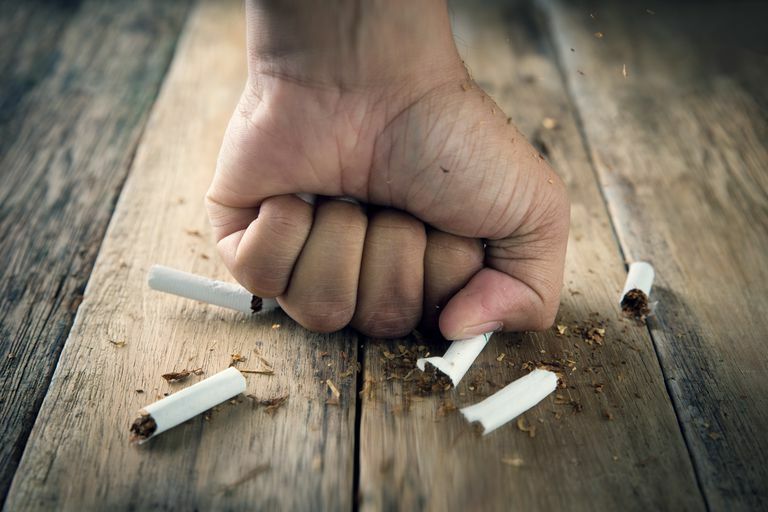 10 Tips to Help You Manage Nicotine Withdrawal: Most people will experience some symptoms of nicotine withdrawal, but in general, the pains associated with this phase of recovery are short-lived, especially if you have a few tools to help you manage them more easily. Tips for Fighting the Urge to Smoke: Take the time to learn which activities you associate with smoking so you can break the connection. When the urge hits, think H.A.L.T. The hungry, angry, lonely, tired checklist can help you decode your urges and move through them. Smoking Cessation Support Forum: Support from those who know what you’re going through is invaluable. Stop in and browse through our very active smoking cessation support community. You may visit as a guest and read messages, or register (free) to join the discussions and post comments of your own. 5 Steps That Lead to a Smoking Relapse: Understanding the psychology that leads to a smoking relapse is the best way to avoid having one. Why People Relapse Years Later: The key to lasting freedom from nicotine addiction lies in changing your relationship to smoking. If you quit smoking by sheer willpower, believing somewhere in the back of your mind that you're sacrificing something good, chances are very high that you'll eventually relapse. CigaretteJust OneThere's No Such Thing as : Most people who quit smoking have romantic thoughts about smoking just one cigarette now and then. It's a normal part of recovery from nicotine addiction, but failing to deal with these errant thoughts has been the cause of many a failed quit program. Don't be afraid to quit smoking. Do the work it takes to get the monkey that nicotine addiction is off of your back. The rewards are outstanding and you'll love the person you become without the chains of this killer habit weighing you down.